As much as I have moved I love to take time and truly personalize a space, as small or large as the budget may be. Right now I am in a small studio apartment, and my dresser doubles as the TV and media stand. I opted for a neutral five drawer dresser for its practicality, future versatility, and unfinished price tag. While killing time on Friday afternoon I wandered into Anthropologie, how can you not love that place?? Every nook and cranny of the store is filled with gorgeous clothes, trinkets, and it is just how I want my ‘one day’ living room to look. To start the look off, I dug through the bin of knobs and picked out an assortment for my dresser. Soon I hope to finish it with a crackle stain finish. I’m just waiting for the heat to die down so Charlie and I can escape the smell for the following hours. I love the look of the mixed knobs, but the chunky sculptured rose is definitely my favorite! 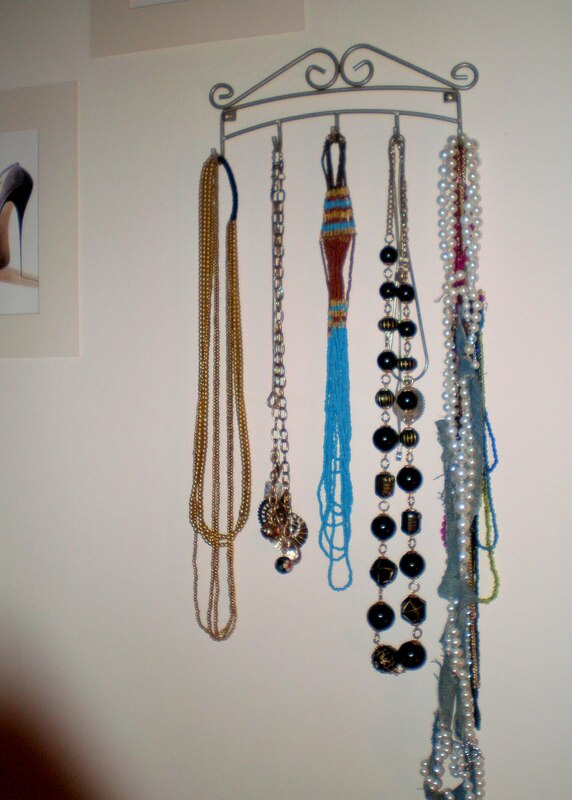 Another space trick is using storage as ‘wall art.’ I used a silver bathroom towel holder to display my necklaces. It perfectly fills in the space between my windows, as long as I keep the arrangement neat. wstrzymaniem upoważnień do zbitego skarbie. I have a blog centered on the same topics you discuss and would love to have you share some stories/information. I know my audience would appreciate your work. 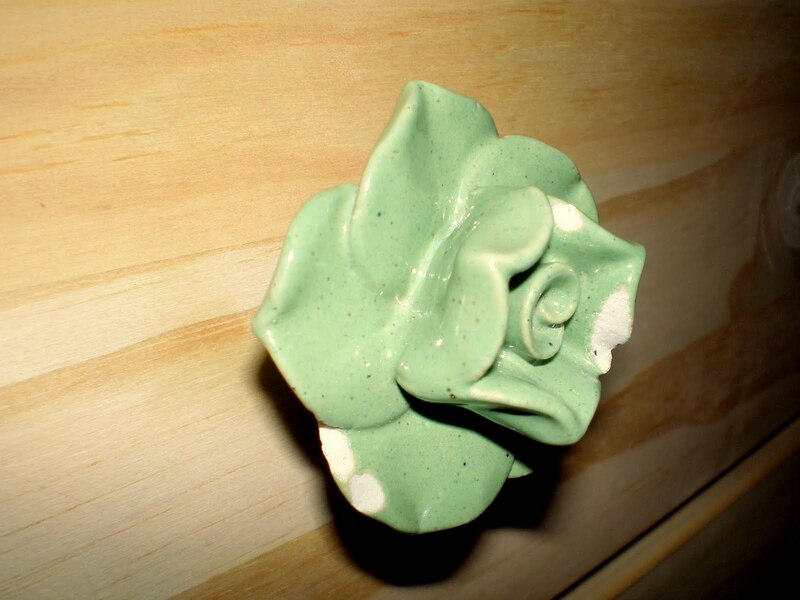 LOVE dressing up a room with decorative knobs! I have so much fun picking them out at Anthro each time I need a new knob! I’ve always been tempted by the Anthropologie knob section, too. Those handles are just adorable! You’ll have to post a pic when you’ve added the crackle finish – sounds gorgeous! I agree, how could anyone not love Anthropologie?! I’ve always wanted to put some of those fancy knobs on my dressers. Yours look great! 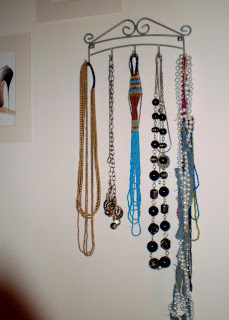 And I love the idea of a towel rack to hang pretty necklaces. Ingenius! i did a jewelry diy recently too. i need to post it! I adore your dresser drawers, those knobs are really cute! I looove everything here – the knobs are so cute and I LOVE the necklace hanger!